A lot of women are very self conscious about their image on the inside as well as on the outside. Having suffered from a low self esteem as a child until my early twenties, I know exactly what it is like to worry about my image. Even though I am older and wiser now I still crave information on how I can feel better about myself. Dawn McIntyres new book, The New Ten Forty Days to Creating a Boldly Beautiful Life from the Inside Out really spoke to me. When I was reading it I got the impression that she had written the book just for me. My Life is Ordinary. My Life is Extraordinary. Each category is broken down into ten days. She sets the book up so that is easy for busy women like myself to read. You can take forty days to read the book by reading one day at a time. Each of the day sections are about four or five pages long. It is an easy read but the book really makes you think. At the end of each day she concludes with a personal statement titled, “What Really Works for Me.” I enjoyed reading about her personal journey in these messages. She explains how she takes her own advice and implements it in her life. By the end of the book I felt a lot more positive about my self image. 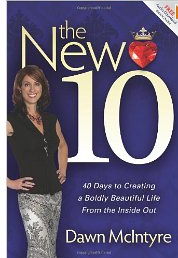 If you are feeling down about yourself or just need a positive lift, “The New Ten Forty Days to Creating a Boldly Beautiful Life From the Inside Out” is the perfect book for you to read. This wonderful book is a great tool to help women and young girls learn how to embrace life and feel comfortable in their own skin. You can purchase The New Ten on Amazon.com for $13.46 or find it at your local bookstore. *Disclosure: I received a copy of The New Ten Forty Days to Creating a Boldly Beautiful Life From the Inside Out from Morgan James Publishing in exchange for this review. All opinions are accurate and 100% mine. What Should You Give your Kids for Snack?